More than 5,000 hits on the first day and 340 registered visitors after two days on sale are impressive numbers on tour "Conquering Son Doong" in 2017. Tour to conquer Son Dong - the largest cave in the world in 2017 has been went on sale on August 15th, attracting 340 registered visitors in only two days. Chua Me Dat (Oxalis) Adventure Tours, the exclusive tour organizer, has noted that the company may only organise tours for more than 500 people during the January to August season of 2017 due to safety and conservation matters. According to Nguyen Chau A, Director-general of Oxalis, the tickets are sold to the first applicants who satisfy all of the health requirements, as the five-day trips require travellers to be able to trek about 50 kilometres in a jungle and mountain; elevation of up to 400m (between road and valleys); river crossings (10-50m wide river, knee deep); 10km caving including rope climbing, rocky terrain and scrambling; 80m descent with rope and harness; crossing underground rivers with strong currents and fives days inside. The tickets for 2017 cost VND66 million (US$3,000) per person. A tour also comprises around 22 porters, 2 cookers, 5 safety assistants, 1 tour guide, 1 cave expert and 2 park rangers to help 10 tourists. If the visitors have not met health requirements, time or cost to conquer Son Doong Cave, they can explore adventure tours to the En Cave, Va Cave, Tu Lan Cave and Tien Cave. 1,300 visitors successfully conquered Son Doong Cave since being opened for tourism on August 1st, 2013, including a group of eight ambassadors from many countries in the world. 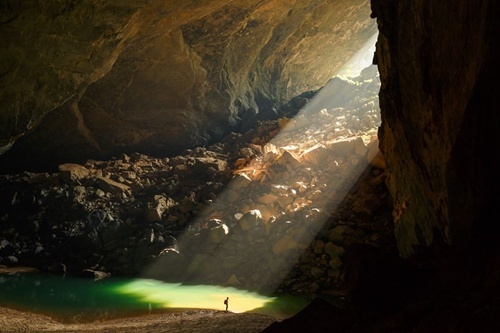 In 2015, number of US visitors to conquer Son Doong Cave ranked top the list, Australia and Vietnam ranked the second and the third respectively. In 2016, Vietnam lists the second, US is still the first. Number of registered visitors in 2017 is currently being confirmed health requirements.